The Unity Kitchen café is a social enterprise providing practical training for working in the hospitality and catering industry and a route into employment. Drinks and homemade hot and cold food. The Bromley by Bow Centre Café first opened its doors in 1986 and has been providing tasty food and drinks ever since. Come and try our delicious and healthy food made from scratch on site with quality sourced ingredients, from chilled sandwiches and salads, to hot lunches, sweet treats and healthy juices. Enjoy the sunshine on our outdoor terrace taking in the views of the beautifully maintained grounds, overlooking our award winning Bob’s Park. Or cosy up inside with friendly faces while enjoying curated exhibitions by local artists. We’re family friendly too located next to a playground. 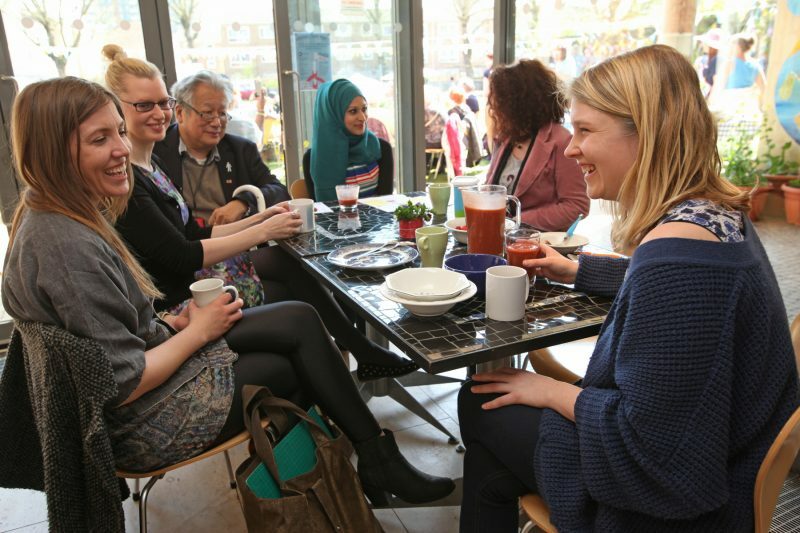 The Unity Kitchen café is a social enterprise, with all profits going back into making a difference to the lives of people with a learning disability. The café provides practical training for working in the hospitality and catering industry, while providing a route into employment.